PARKING TIM d.o.o. was elected in June 2015 in a public tender - parking spaces owned by the Dubrovnik General Hospital, in activities of management, maintenance, billing and control of parking at 460 parking spaces that are located around the building of the General Hospital Dubrovnik. For hospital employees a portion of parking spaces has been secured. Consequently, PARKING TIM d.o.o. carried out all necessary preparation activities (delineation of parking spaces, installation of parking traffic signs, etc. ), then all the logistic operations as well as the procurement of necessary parking equipment. Along the most modern equipment for parking payment and payment via SMS (mParking - 707008) we introduced payments through mobile applications ParkWallet on iOS (iPhone) and Android platforms via credit card. By this improvement, city of Dubrovnik was among the first in Croatia that introduced this form of payment for parking. It is free application for the payment of parking via smartphones at no cost towards the mobile operator, which greatly reduces the cost of parking payment. 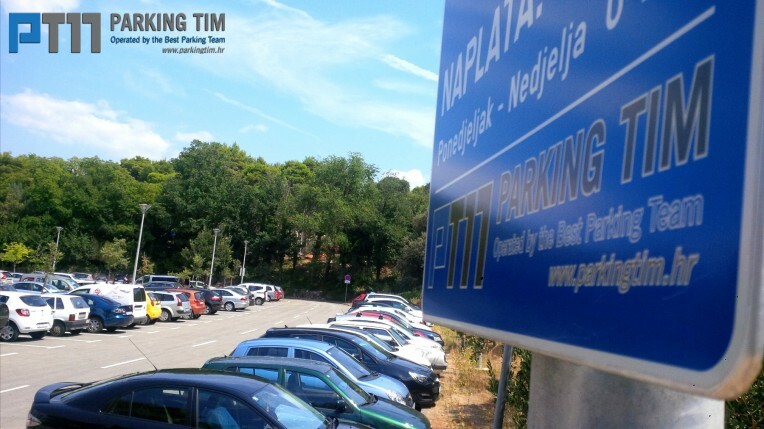 As well, we provide the possibility of using privileged parking ticket for legal entities and individuals, as well as the tourist weekly tickets as a special offer due to immediate vicinity of the Dubrovnik airport. Dubrovnik is a city located on the southern Croatian coast, the economic center of the Dubrovnik-Neretva County and one of the most historic Croatian tourist destinations with more than 250 sunny days a year. Dubrovnik is unique in the world because of the impressive medieval fortresses, churches, monasteries and palaces, and it is often called the pearl of the Adriatic. More than a thousand years of its history have made Dubrovnik a European cultural center, and in 1979 the city of Dubrovnik joined the UNESCO list of World Heritage Sites. Today Dubrovnik is one of the world centers of tourism and culture. One of the biggest underground parking garages in Croatia, with 900 parking spaces on 5 floors (4 underground ones and 1 ground floor) on an area of 20,000 square meters. There are 3 entrance and 3 exit barriers with an additional option on level -4 where there is a special section for clients with a subscription. Web hosting solutions for demanding users - high-quality servers located in the best European data centres. We offer high-quality and fast web hosting packages located on strong servers run by professionals. Unlimited options are included in all our packages. e. .
During web development we pay maximum possible attention to optimisations, so that your website can appear as high as possible in search engine results. Every web development task is unique and we offer an original web design to every client..